For outdoor accessories that completes your seating set without sacrificing durability, look no further. Add a luxurious natural stone top accent table to your outdoor space to create an extra space where you can keep items with in reach and off the ground. This outdoor side table is specifically designed to match our Portofino Collection with the added style and design of natural stone veneer, but looks great next to any of your outdoor furniture sets. 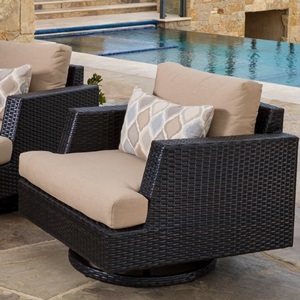 Chalk outdoor resin wicker with warm Espresso natural stone top. Beautiful and durable stone top veneer made with real stone and synthetic fibers.